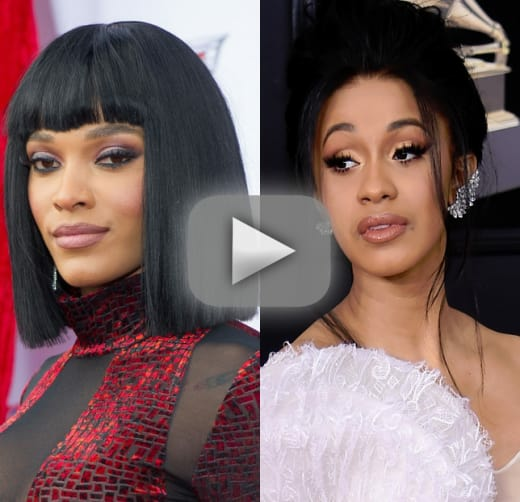 Cardi B Diss Track by Joseline Hernandez ROASTED on Twitter! Joseline Hernandez might not be happy that Cardi B is on top of the world right now, but the Love & Hip Hop: Atlanta star knows an opportunity when it comes a-knocking. She has a diss track on Cardi, and she teased the music video on Twitter. And she's getting roasted mercilessly over it. You can see and hear this panned diss track music video teaser below ... if you dare. Joseline Hernandez, the self-described "Puerto Rican Princess," is best known for her role on Love & Hip Hop: Atlanta, where she brings boundless drama. A huge source of that drama is that Joseline generally believing that she's better than everyone there. As it turns out, that feeling of superiority doesn't just extend over her costars in Atlanta, but over the entire franchise. Cardi B is best known for, you know, her meteoric rise to fame with one of 2017's hottest singles. But before that, she appeared on Love & Hip Hop: New York. Cardi B and Joseline both worked as strippers before joining the Love & Hip Hop franchise. Now, however, their careers are on very different paths. These days, Cardi B is famous. "Bodak Yellow" is a smash hit. If it weren't for "Despacito," it might have been the song of 2017. Cardi B landed her contract with Atlantic Records and left her reality career in the dust -- for the moment, anyway. Her wedding to Offset may get televised if the money is right. That doesn't mean that things are perfect, what with a woman claiming to be Offset's baby mama so soon into Cardi B's engagement to him. Still, Cardi B's star is high and shining bright. "Bodak Yellow" is certified triple-platinum. "These expensive, these is red bottoms / These is bloody shoes"
"…drag a Bronx b--ch yea I said it… Fabricated, illustrated, cartoon a-- b--ch, bloody, my a--! Who the f--k cosigned this hoe?" "Joseline just had to be a nice hoe and thinks would have been okay. Evil hoes never prosper." "Rapping is NOT for you Auntie." Joseline Hernandez isn't the first to try to cling to Cardi B's coattails by trying ot bash her publicly. Azealia Banks tried to feud with Cardi B. Remember that? It didn't turn out so well. When you bash someone's musical talent but then you're recorded dancing to her irresistibly good song, it really takes the wind out of your argument. But the point behind bashing someone who is a soaring success isn't to drag them down, but to get yourself noticed. Unfortunately for Joseline Hernandez, the attention that she's drawn to herself has been decidedly negative. See for yourself if the epic dragging that Joseline's received on social media has been well-deserved. I can't claim to be a rap expert, and few of us can neutrally listen to a Cardi B diss track without having an opinion -- one way or the other. And Joseline already has a less-than-ideal reputation among those who know her for her role on Love & Hip Hop: Atlanta. Maybe people just hate her. Or maybe, just maybe, her diss track is really that awful.